NEW YORK, Feb. 12, 2019 /PRNewswire/ — Tapinator, Inc. (OTCQB: TAPM), a publisher of category leading apps for mobile platforms, today announced the January 31, 2019 global release of Crypto Trillionaire exclusively on Apple’s iOS platform. In order to bring this unique, best-in-class idle tapper game to mobile players worldwide, Tapinator has joined forces with the game’s developer, Robot Cake Games of Hannover, Germany. 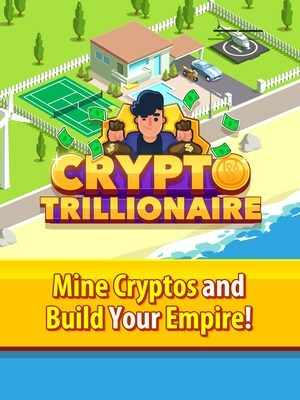 Crypto Trillionaire is the first of several planned major releases for Tapinator’s Category-Leading Games & Apps business for 2019. Future releases will be announced in the coming months. Tapinator Inc. (OTCQB: TAPM) develops and publishes category leading apps for mobile platforms. Tapinator’s library includes over 300 titles that, collectively, have achieved over 450 million mobile downloads, including notable properties such as Video Poker Classic, Dice Mage and Solitaire Dash. Tapinator generates revenues through the sale of branded advertising and via consumer transactions, including in-app purchases and subscriptions. Founded in 2013, Tapinator is headquartered in New York, with product development and marketing teams located in North America, Europe and Asia. Consumers can find high-quality mobile entertainment wherever they see the ‘T’ character logo, or at http://tapinator.com. Crypto Trillionaire is a mobile app game developed solely for entertainment purposes. It does not allow players to purchase, accumulate, trade, or otherwise transact in actual cryptocurrency or crypto-assets of any kind. To the extent that statements contained in this press release are not descriptions of historical facts regarding Tapinator, they are forward-looking statements reflecting the current beliefs and expectations of management made pursuant to the safe harbor provisions of the Private Securities Litigation Reform Act of 1995. Words such as “believe,” “feel,” “may,” “will,” “expect,” “anticipate,” “estimate,” “intend,” and similar expressions (as well as other words or expressions referencing future events, conditions or circumstances) are intended to identify forward-looking statements. The forward-looking statements include, among other things, our intention to make Crypto Trillionaire a true category leader within the idle tapper genre across all major mobile platforms through significantly investing in product updates and marketing, our expectation that game enhancements will continue to improve player engagement and lifetime value thereby allowing us to scale our user acquisition budget and our belief Crypto Trillionaire will have a material positive impact on our 2019 bookings results. Forward-looking statements in this release involve substantial risks and uncertainties that could cause the development and monetization of our mobile games and apps, future results, performance or achievements to differ significantly from those expressed or implied by the forward-looking statements. Such risks and uncertainties include, among others, our ability to invest our financial and development resources in a way that will lead to Crypto Trillionaire becoming a true category leader, our ability to continue to attract and retain Crypto Trillionaire players, the possibility of our competitors developing games that players prefer to Crypto Trillionaire, our ability to utilize Robot Cake Games to successfully increase the adoption of Crypto Trillionaireglobally and our ability to successfully develop updates and future features of Crypto Trillionaire which players will adopt. Tapinator undertakes no obligation to update or revise any forward-looking statements. The quoting and trading of the Company’s common stock on the OTC Market Group’s OTC Link quotation system is often thin and characterized by wide fluctuations in trading prices, due to many factors that may have little to do with the Company’s operations or business prospects. As a result, there may be volatility in the market price of the shares of the Company’s common stock for reasons unrelated to operating performance. Moreover, the OTC Market Group’s OTC Link quotation system is not a stock exchange, and trading of securities on it is often more sporadic than trading of securities listed on the NASDAQ Stock market or another securities exchange. Accordingly, stockholders may have difficulty reselling any of their shares. For a further description of the risks and uncertainties that could cause actual results to differ from those expressed in these forward-looking statements, as well as risks relating to the business of the Company, see Tapinator’s Risk Factors which are available within the disclaimers section of Tapinator.com.